Master Builder magazine is a 72-page, full-colour publication distributed to Master Builders members and other key industry stakeholders in Queensland and at various tradeshows and events. Content is written in-house by a team of technical experts, with a coordinating Editor devoted to ensuring articles are relevant, up-to-date and written in plain English. If you want to position your product or service directly in the eyes of the decision makers, advertise in Master Builder magazine. Build Source is Master Builders annual business directory for builders and contractors. Produced annually it is packed with information about building materials, supplies and services and helps builders and trade contractors locate the right product, information, resource or expertise to get the job done. Drive traffic directly to your website with Master Builders' digital advertising opportunities. Building Insights is distributed to all Master Builders members with a valid email address and is an integral method of communication with members. 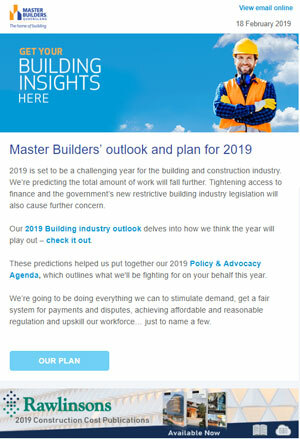 Building Insights focuses on the latest news and issues affecting members, as well as forecasting information, industry analysis and a summary of Master Builders’ upcoming training courses and events. Delivered in HTML format via reputable email marketing tool, Vision6, means that editorial is graphically enhanced, navigation is easy, and advertising is dynamic and easily tracked.